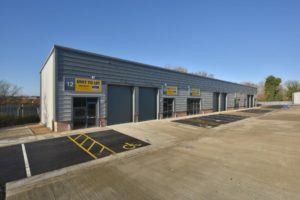 Northern Trust has officially opened the new 13 unit, 42,447 sq ft industrial development on their popular Leyland Trading Estate in Wellingborough. 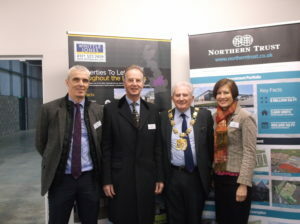 The new development which is being part funded by the South East Midlands Local Enterprise Partnership (SEMLEP) Local Growth Fund was formerly unveiled at a breakfast reception on the 22nd November when Northern Trust welcomed local dignitaries, council representatives, and members of the business community to the new development. From left to right: Tom Parkinson, Director Northern Trust Co Ltd; Councillor Tim Allebone, Borough Council of Wellingborough, The Mayor of Wellingborough (Malcolm Ward) and Judith Barker, SEMLEP’s (South East Midlands Local Enterprise Partnership) Director of Programmes & Governance. Leyland Trading Estate, which is ideally located for access to the A14 and M1, now extends to over 230,000 sq ft and is home to over 110 businesses. The new scheme has added an additional 3 separate terraced blocks of industrial and workshop units with sizes ranging from 542 sq ft up to 8,928 sq ft.